As many as 46 delegations from all over the world took part in the 8th Congress of the International Show Caves Association (ISCA). Five continents were represented at Genga-Frasassi, Italy, comprising some of the most representative show caves in the world. 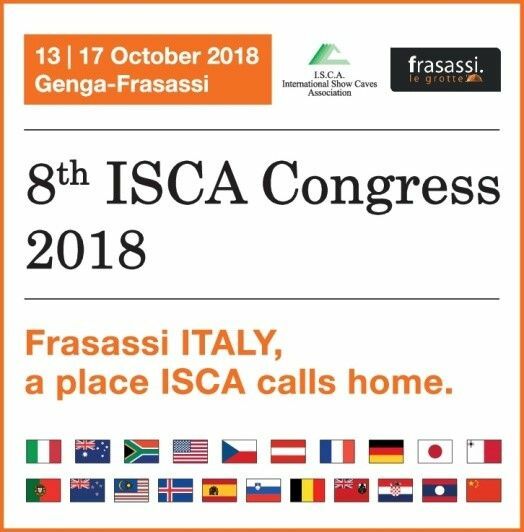 In order to highlight the role of Genga-Frasassi as the location where ISCA was founded and headquartered, the Congress adopted the slogan: “Frasassi, Italy, a place ISCA calls home”. The meeting took place in the territory of Genga-Frasassi from 13th to 17th October, and the theme was “Innovation in Show Cave Management”. Dynamic pricing, science, tourism development, new media and state-of-the-art lighting were some of the topics addressed during the daily sessions held at the Art Museum in Genga’s Castle. The opening ceremony was held in the Oratorio della Carità, a beautiful oratory in the historiccentre of Fabriano, which was decorated at the end of the 16th century by the painter Filippo Bellini. Dignitaries who attended the opening ceremony included: Gabriele Santarelli, Mayor of Fabriano; Giuseppe Medardoni, Mayor of Genga; Ugo Pesciarelli, Mayor of Sassoferrato; Moreno Pieroni, Councillor of the Marche Region responsible for Tourism; as well as local civilian and military authorities. The ISCA President, Brad Wuest from Natural Bridge Caverns (Texas, USA), and all the conventioneers were also in attendance. George Veni (New Mexico, USA), President of the International Union of Speleology (UIS), made the first presentation on “UIS Goals, Projects and Common Interests with ISCA”. (www.uis-speleo.org). Following, Veni and Wuest spoke about the International Standards Organization’s (ISO) newly formed Technical Committee on Karst and how ISO Standardization could impact show caves and speleology. Harry Tomasides (Indiana, USA), Chief Revenue Officer Digonex Technologies, presented “How Dynamic and Variable Pricing Can Increase Revenue, Improve Visitor Experience, and Lower Visitor Environmental Impacts for Show Caves” (www.digonex.com). Nadja Zupan Hajna (Ljubljana, Slovenia), from the Karst Research Institute, presented “Development of Karst Sciences and Use of Science in Show Caves: Examples From Slovenia” (https://izrk.zrc-sazu.si/en/sodelavci/nadja-zupan-hajna-en#v). Terry Bolger (Laos) presented “Tourism Development at the Xe Bang Fai Cave, Laos” (http://www.hinnamno.org/from-the-units/eco-tourism-unit/xe-bangfai-river-cave.html). Rod Graves (Virginia, USA) presented “New Entrance to Luray Caverns: Tunnelling and Construction” (www.luraycaverns.com). Alexander Chrapko (Herborn, Germany), Manager of Cave Lighting Co., presented “Modern LED Lighting Systems for Show Caves: The Example of Frasassi Caves and Grotte De Han” (www.cavelighting.de). In addition to the business sessions, the ISCA congress also offered many excursions, including visits to the world famous Frasassi Caves. Attendees agreed that Frasassi is one of the most spectacular show caves in the world with giant chambers and beautiful speleothems, and many expressed their emotional response to the caves’ enormous size and beauty. The night excursion to the cave was particularly appreciated. The attendees entered total darkness equipped with helmets and torches. As soon as they reached the well-known speleothem, called “The Giants”, they started hearing a song in the distance until the tenor Massimo Prosperi appeared in the darkness. Greeted by a thunderous applause, he sang a series of classical pieces. Other excursions included touring the medieval town of Jesi, truffle hunting at Acqualagna where participants enjoyed watching the skilled dog find truffles, dig them up, and bring them to his master. After experiencing the traditional truffle hunting, they enjoyed a truffle lunch accompanied by the best local wines. Another afternoon, attendees enjoyed the view from Monte Conero and Portonovo Bay on the Adriatic Sea. Attendees also visited the Beata Vergine cave and adventurously climbed the mountain, Monte Cucco one foggy afternoon to tour the cave within the mountain. ISCA’s Secretary/Treasurer, Renata Marinelli, affectionately known as “the Mother of ISCA”, retired at the end of the Congress. Marinelli was granted Honorary Membership in grateful appreciation for her 28 years of dedication and outstanding service to ISCA. It was very fitting that the last congress Marinelli helped organize was in her home town, Genga-Frasassi. Honorary Membership was also given to Past President, David Summers, in grateful appreciation for his dedication and outstanding service to the International Show Caves Association. Summers served as ISCA’s President for 8 years and travelled around the world representing the show cave industry and growing membership. Greg Passmore of Passmore Lab, who is a new media designer, film director, and cave enthusiast was appointed Chairman of ISCA’s newly created Media Committee. The following 23 countries were represented at the 2018 ISCA Congress: Italy, USA, France, Belgium, Austria, Germany, Spain, Portugal, China, Japan, Croatia, Slovenia, Slovakia, Czech Republic, Malta, Laos, Bermuda, Iceland, Australia, New Zealand, Malaysia, UK and South Africa. ISCA congresses are held every 4 years in a different part of the world. In 2022, ISCA’s 9th congress will be held for the first time in the USA in San Antonio, Texas hosted by Natural Bridge Caverns (www.naturalbridgecaverns.com). The International Show Caves Association (ISCA) was founded in 1990 and is headquartered in Frasassi/Genga, Italy. ISCA is an international organization of persons, associations, corporations, and government agencies who own, manage or operate show caves that are open to the public. ISCA provides a critical forum for show caves to network and collaborate on matters that pertain to their caves. ISCA aims to promote, encourage, and support the cooperation of show cave operators, speleologists and cave enthusiasts through the sharing of information and to promote the preservation and conservation of caves, while increasing public interest in the world of show caves by way of unique marketing and the evolution of methods to enhance the show cave experience. For more information on the International Show Caves Association and its members, please visit www.i-s-c-a.com. For more information on the International Union of Speleology (UIS), please visit www.uis-speleo.org. Copyright © 2018 ISCA, All rights reserved.